The Art Of Lutherie offers a glimpse into the mind and craft of luthier Tom Bills, whom many consider to be one of the most talented luthiers today. 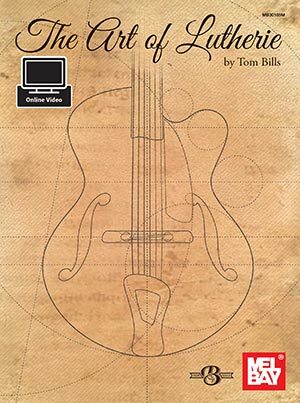 In this beautifully written and enjoyable read, Tom elegantly and clearly shares his best-kept secrets and methods of custom guitar making - those which make his guitars favorites among top collectors and players. Tom's unique approach to The Art Of Lutherie will empower and inspire you to create more than just a guitar, but a truly unique work of art. The information that is generously shared within this insightful and timeless work is both practical and applicable. It contains the same hard-won wisdom that only comes from years of experience and experimentation that Tom uses in creating his inspiring instruments. Over the years, he has produced instruments considered to be some of the best sounding guitars ever made. Learning the steps of how to build a guitar is important, but understanding why master luthiers take those steps and make those decisions can empower you to make your own educated choices. This will allow you to create unique guitars, and the world needs your art, your guitars - your important contribution. The Art Of Lutherie, a truly unique and inspiring guide, can prepare you to reach new heights when designing and creating unique guitars. "It is not often I heap such lavish praise on people; however, Tom is in this case more than deserving: I know of no other luthier whose work I respect more. Tom knows his craft inside and out; he pours his soul into every guitar he makes; he uses cutting-edge science to guide his work, and it shows...as head of Artist Relations and Product Development at Mel Bay, it gives me great pleasure to publish Tom's work, which will no doubt take the art of lutherie to a new level. I hope you'll spend some time soaking in this book - it will certainly augment your musicality - Collin Bay. Includes access to online video. Always on point when Tom Bills is teaching.As one of students,it reinforces what he teaches in his classes.Excellent stuff! I received this book in the mail today. I was excited and eager to learn what secrets this book might reveal. I had visited the authors site in the past and watched his free video offerings. I thought this book would be a good indication to help me decide if his membership site and expensive educational program were worth while. If this book is any indication, they are not. I won't be pursuing any further offerings or products from this author. Most topics were breezed through in less than half a page. I wanted to believe there would be some useful information passed on, but there was none. Other reviewers have mentioned the authors infomercial videos and Tony Robbins sales pitch, that isn't what bothered me about this book. It's the fact that I spent money, hoping to gain knowledge that would improve my guitar builds and that money was wasted. I'm mad this book that I purchased is, in my opinion, completely devoid of any useful factual information in regards to luthiery. But honestly, I'm mostly mad at myself for being duped into buying the book. My money would have been much better spent on a new bandsaw blade. This book was like skipping a stone over a lake to show how deep it is. Little or no valuable content.